Before the arrival of European Americans, wetlands were present across the length and breadth of the Central Valley. Waterfowl and other waterbirds swam on the surface or stood in the shallows of permanent and seasonal freshwater marshes, which were renewed annually by the spring flooding of the valley's rivers. Thundering honks and quacks of enormous flocks of geese and ducks, descending from the sky or taking flight en masse from the water, revealed from afar the locations of these marshes, clustered in the low-lying and poorly drained basins (or troughs) of the valley. Ephemeral vernal pools and larger playa pools, filled with aquatic invertebrates and surrounded by brilliantly colored flowers, lay scattered amid millions of acres of native valley grasslands. Expansive riparian forests with their massive valley oaks, as well as evergreen oaks, cottonwoods, and sycamores, lined the major rivers and creeks, creating thick ribbons of green and vertical relief from the flat valley floor. Within these seasonally flooded forests, herons, egrets, and cormorants roosted in colonies, and brightly colored wood ducks nested and raised their young in tree cavities. Each of these three natural communities-freshwater marsh, valley grassland, and riparian woodland-either was defined by wetlands or contained a wetland element, and at least some of the plants and animals in each community were adapted to live in wetlands. Over the past two centuries, each community has been dramatically altered and numerous species of flora and fauna have been displaced, waterfowl not least among them. The history of each community therefore reveals a distinct component of the overall ecological transformation of the Central Valley and the disappearance of its wetlands. The Great Central Plain of California, during the months of March, April, and May, was one smooth, continuous bed of honey-bloom, so marvelously rich that, in walking from one end of it to the other, a distance of more than 400 miles, your foot would press about a hundred flowers at every step. Mints, gilias, nemophilas, castilleias, and innumerable compositae were so crowded together that, had ninety-nine percent of them been taken away, the plain would still have seemed to any but Californians extravagantly flowery. The radiant, honeyful corollas, touching and overlapping, and rising above one another, glowed in the living light like a sunset sky-one sheet of purple and gold, with the bright Sacramento pouring through the midst of it from the north, the San Joaquin from the south, and their many tributaries sweeping in at right angles from the mountains, dividing the plain into sections fringed with trees. Although Muir may have taken some literary license in claiming that the entire Central Valley was covered in wildflowers, this passage is worth savoring, because we are unlikely ever to see such a scene. Only about 1 percent of the native valley grassland remains. As historical geographer William Preston has written, "The most dramatic alterations anywhere in continental America occurred within California's grasslands." Unlike the riparian woodlands and freshwater marshes, Central Valley grasslands were already significantly altered during the years before California statehood in 1850. Alien grasses of Mediterranean origin appear to have become established prior to the beginning of the Spanish mission period in 1769, perhaps from seeds disseminated during earlier exploratory voyages. One of the most telling pieces of evidence for this early establishment has been the discovery of specimens of introduced grasses in the adobe bricks of the earliest Spanish missions. During the Spanish period, cattle grazed widely in coastal California; after the Mexican government began granting large ranchos under the terms of the Colonization Act of 1824, cattle spread into the Central Valley as well. Overgrazing and extended periods of drought, such as that from 1828 to 1830, weakened the competitive abilities of native grasses compared to nonnatives. Native perennial grasses in particular were inferior competitors to nonnative annual grasses because annual grasses produce deep and extensive root systems more rapidly than perennials and thus can acquire a larger share of soil nutrients and soil moisture. Under these conditions, the grasses wild oats and ripgut brome became established near the missions along the southern and central coasts and spread inland, expanding first into the San Joaquin Valley and, by the time of the Gold Rush, into the Sacramento Valley as well. Accounts by early travelers corroborate this chronology. During his travels in California from July 1833 to July 1834, fur trader Zenas Leonard reported seeing "a large prairie covered with wild oats," which he called the "Oat Plain," in the lower San Joaquin Valley, near the confluence of the Merced and San Joaquin rivers. Farther north, near the Mokelumne River, Edwin Bryant recorded on September 14, 1846, "We passed through large tracts of wild oats during the day; the stalks are generally from three to five feet in length." Thus, archaeological evidence and travelers' accounts suggest that long before the first marshes were drained or riparian woodlands cleared, the matrix of valley grasslands in which they lay had already been transformed. The Gold Rush led to a dramatic increase in grazing pressure, especially in the Central Valley. Native grasses and forbs were adapted to seasonal grazing by herds of pronghorn and tule elk, as well as deer, rabbits, and rodents, but not to the continuous and heavy grazing of millions of domesticated sheep and cattle. By 1860, at the height of the cattle boom, there were one million domestic cattle grazing in California. Drought conditions during the 1860s led to the widespread replacement of cattle by sheep, which could survive on less forage, and by 1880 the number of sheep in California had peaked at 5.7 million. By this time, the combination of drought and overgrazing had destroyed much of the native valley grassland. As a result, today the most common grassland species are all introduced European annuals: filaree, soft chess, wild oat, ripgut brome, annual ryegrass, foxtail, fescue, and California burclover. Scattered throughout much of the valley grassland are complexes of vernal pools, seasonal ephemeral wetlands that form in shallow depressions underlain by an impermeable surface such as claypan, hardpan, or rock. They are fed primarily by winter precipitation, but also by surface swales and subsurface water flow. As the pools dry up in the spring and hot summer months, a number of annual plant species flower, often in conspicuous concentric rings of vibrant colors. Among the most common plants are meadowfoam, goldfields, popcornflowers, and downingia. The soil and hydrologic conditions in vernal pools render it difficult for exotic plant species to invade, with the result that they are one of the few low-elevation habitats still dominated by native species. Despite increasing fragmentation and overall estimated losses of 60 to 85 percent, vernal pool habitat remains in every county of the Central Valley, forming a ring along the valley's perimeter and a swath in the basin lands along the valley's floor. Central Valley vernal pools and their adjacent uplands provide habitat for plants, aquatic invertebrates, amphibians, reptiles, birds, and mammals, including approximately eighty species of plants and animals that are listed as endangered, threatened, or of special concern. The larger vernal pools, known as playa pools, provide important foraging and courtship areas for numerous species of migrating ducks, as well as locally breeding mallards, gadwalls, and cinnamon teal. The abundant invertebrate fauna in the pools provide an important source of protein and calcium necessary for the ducks' migration and reproduction. The pools also support many additional species of wetland birds, including tundra swans, great egrets, great blue herons, black-necked stilts, and American avocets. The protein-rich grasses of the adjacent uplands provide an optimal food source for Ross's, white-fronted, Canada, and cackling geese, as well as American wigeon, a grazing duck species. Thus, despite their relatively small size and ephemeral nature, vernal pool landscapes provide vital links in the Central Valley portion of the Pacific Flyway. The largest and most diverse riparian forests occurred on those rivers having well-developed natural levees, but riparian systems were found along virtually all of the numerous watercourses in the Central Valley. In the Sacramento Valley, the Feather, Yuba, Bear, and American rivers, as well as the substantial Butte Creek, drain westward into the Sacramento River from the Sierra Nevada. Natural levees of the Sacramento River and naturally occurring flood basins historically blocked some streams from reaching the main river system. Instead, these streams, including Putah and Cache creeks, which flow eastward out of the Coast Ranges, spread out over the valley floor, typically pooling in expansive sinks of tule marsh, and connecting to the Sacramento River only by subsurface flow. The San Joaquin Valley-drier on the whole than the Sacramento Valley-possesses few significant drainages from the Coast Ranges but a greater number of major rivers draining from the Sierra Nevada, including, in addition to the San Joaquin River itself, the Cosumnes, Mokelumne, Stanislaus, Tuolumne, Merced, Kings, Kaweah, Tule, and Kern rivers. Riparian forests along these rivers and creeks extended from the banks to the edge of the moist soil zone, and, in many cases, as far as the hundred-year flood line. These complexly structured forests achieved their greatest widths, four to five miles on each side, on the banks of the lower Sacramento River, where natural levees are widest. Forming the canopy was the signature tree of the Central Valley, the massive, sprawling, deciduous valley oak, along with the broad evergreen interior live oak, the Fremont cottonwood, and the western sycamore. Intermediate layers were composed of box elder, Oregon ash, alder, and various species of willow. The diverse undergrowth included such species as wild rose, blackberry, and poison oak. Vines, including wild grape, often grew through the various layers. The valley oak, in particular, captured the attention of early visitors to the valley. Along his journey up the Sacramento River in 1837, Captain Sir Edward Belcher of the British Royal Navy reported, "Within, and at the very edge of the banks, oaks of immense size were plentiful. These appeared to form a band on each side, about three hundred yards in depth.... Several of these oaks were examined, and some of the smaller felled. The two most remarkable measured respectively twenty-seven and nineteen feet in circumference, at three feet above ground. The latter rose perpendicularly at a (computed) height of sixty feet before expanding its branches, and was truly a noble sight." Riparian vegetation in the Central Valley was quickly destroyed in the wake of the Gold Rush, when many prospectors turned toward agriculture as a source of a more stable livelihood. Growing agricultural communities utilized the riparian forests, which were often the only significant woody vegetation on the valley floor, for fencing, lumber, and fuel. The soil on the rivers' natural levees, which supported these forests, was highly fertile, easily managed, and not subject to the seasonal flooding of lower ground just beyond. Orchards, in particular, were suited to these well-drained soils, and much riparian vegetation was therefore removed to make way for fruit trees. The ecological importance of these riparian forests was not fully realized until the second half of the twentieth century, by which time only an estimated 2 percent to 6 percent of historical riparian areas remained. Riparian trees reinforce riverbanks and provide greater stability to river channels, and they act as windbreaks and reduce evaporation. The forests provide critical habitat for aquatic, terrestrial, and arboreal wildlife, including mammals, reptiles, amphibians, and birds. Waterbirds-especially great blue herons, great egrets, snowy egrets, black-crowned night herons, and double-crested cormorants-roost there in sizable colonies. Among waterfowl, wood ducks and common mergansers raise their young in tree cavities. The disappearance of the riparian forests is particularly associated with a historical decline in the abundance of the beautiful, artfully colored wood duck, once a common year-round resident in the Central Valley, and now the object of conservation efforts. The Central Valley's seasonal and permanent freshwater marshes were historically located in the numerous river overflow basins of the Sacramento and San Joaquin valleys as well as in the tidal channels of the Sacramento-San Joaquin Delta. The Sacramento Valley contains five major flood basins, three-Butte, Sutter, and American-to the east of the Sacramento River, and two-Colusa and Yolo-to the west. The basins were initially formed and then repeatedly flooded by the Sacramento River itself. After descending into the valley from its headwaters in the Klamath Mountains to the north, during flood stages the Sacramento River deposited sediments beyond its banks. Because the velocity of floodwaters decreases as soon as they escape a river channel, the Sacramento River deposited its coarse, heavier sediments first, thereby creating natural levees. As the floodwaters extended farther out onto the floodplain and lost their remaining velocity, they dropped the rest of their sediment load. These finer sediments became the basis for the valley's adobe (clay) soils. This land reaches low points (troughs) on either side of the river before beginning to rise again onto alluvial deposits from the Sierra Nevada to the east and the Coast Ranges to the west. These natural basins acted as reservoirs for winter floodwaters and could remain inundated well into the spring, providing vast breeding as well as wintering areas for waterfowl. While the other basins have been largely reclaimed, the Butte Basin, farthest to the north, continues to support the highest concentration of waterfowl anywhere in the Sacramento Valley. Just beyond the western apex of the Delta lies the brackish Suisun Marsh. Technically beyond the boundaries of the Central Valley, Suisun Marsh is part of the coastal estuary that includes San Francisco Bay, the largest estuarine system on the Pacific Coast of the Americas. Despite its peripheral location relative to the Central Valley, Suisun Marsh is of great importance to the wintering waterfowl of the valley, and therefore is often included in Central Valley habitat studies. Encompassing approximately 116,000 acres of tidal wetlands, managed wetlands, bays, sloughs, and associated uplands, every year during the fall Suisun Marsh provides for early-arriving waterfowl from the north until winter precipitation makes new habitat and food sources available in the Central Valley. Draining into the Delta from the south, the San Joaquin River has its origins high in the southern Sierra Nevada, at Thousand Island Lake in the towering thirteen-thousand-foot Ritter Range. When the river reaches the San Joaquin Valley floor it first flows to the west, defining the southern limit of the San Joaquin Basin. After passing north of the city of Fresno, the river turns sharply northward and flows through the middle of the basin on its journey to the Delta. Overflow wetlands in the San Joaquin Basin were historically associated with the San Joaquin River, as well as its major Sierran tributaries, the Merced, Tuolumne, and Stanislaus rivers. Floodwaters created extensive wetland habitat consisting of permanent lakes, sloughs, and ponds as well as both permanent and seasonal marshes. The most significant marshes still remaining are in an area of overflow lands-known as the Grasslands-that lie astride the San Joaquin River, largely in Merced County. 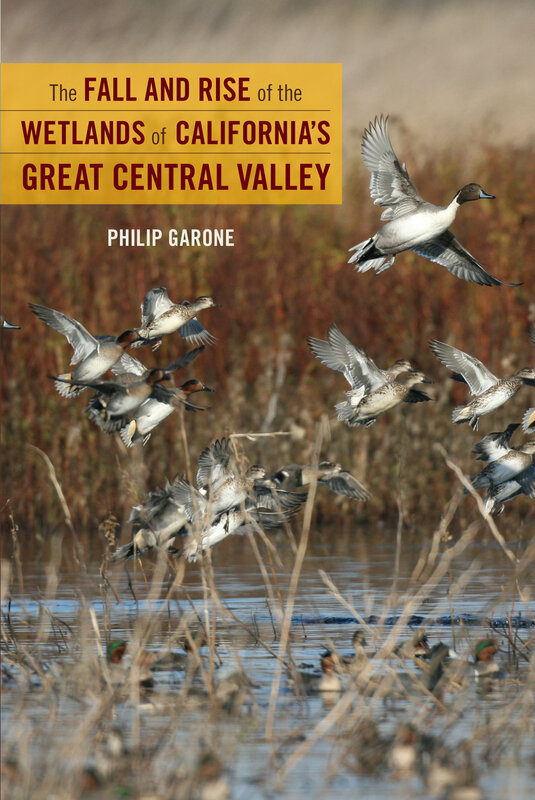 The Grasslands continues to be of tremendous importance to waterfowl, and, as later chapters will demonstrate, its history is inextricably woven into the story of the changing fortunes of the Central Valley's wetlands and waterfowl. Located south of the San Joaquin River, the Tulare Basin occupies the broadest portion of the San Joaquin Valley. At the basin's southernmost extreme rise the Transverse Ranges, which separate the San Joaquin Valley from the Los Angeles Basin and Southern California. Watered by the Kings, Kaweah, Tule, and Kern rivers, all of which flow out of the Sierra Nevada, the Tulare Basin has no direct outlet to the Pacific Ocean. As a result, before large-scale diversions for agriculture, these rivers filled several enormous lakes at the lowest points in the basin, including Tulare, Buena Vista, and Kern lakes. Together with their surrounding marshes, these lakes provided the largest single block of wetland habitat in the Central Valley, and in all of California. Yet virtually all the wetland habitat in the Tulare Basin has been lost, resulting in a dramatic decline in the basin's waterfowl populations. The waterfowl that depended on the Central Valley's extensive wetlands-and that still rely on the remaining wetlands-are far more ancient than the Central Valley itself. These birds first appeared on Earth during the early Cenozoic era, approximately fifty million years ago, many millions of years before the Central Valley emerged from the depths of the sea. Waterfowl are found on all continents and many isolated islands worldwide. They compose the family Anatidae, which includes ducks, geese, and swans, and they number approximately 150 species in at least 45 genera; one-third of these species occur in North America, and most can be found along the Pacific Flyway, including California's Central Valley. All waterfowl species are dependent on wetlands, and every waterfowl species has precise dietary requirements that are satisfied by wetlands. Swans and geese are almost entirely vegetarian in their diets. Swans forage primarily on submergent vegetation but may also graze in meadows. Geese are specialized as grazers in meadows and adjacent uplands but may also feed in wetter areas on tuberous plants. In most species of geese the cutting edges of the upper and lower mandibles are coarsely serrated, providing an effective method of clipping off vegetation close to the ground. Important species of swans and geese that winter in the Central Valley are the tundra swan, greater white-fronted goose, snow goose, Ross's goose, and various subspecies of Canada and cackling goose. Ducks are classified as dabbling (or surface-feeding) ducks and diving ducks, the latter including pochards (bay ducks), stiff-tailed ducks, and sea ducks and mergansers. Dabbling ducks, the most widespread of all waterbirds, are considered the most adaptable of all waterfowl. They are flexible in food choices and are pioneers in new habitats. During nonbreeding seasons they eat seeds and other plant reproductive parts that provide carbohydrates for energy and fat storage. During prebreeding and molting periods, the diet of the adults of most species shifts toward protein-rich aquatic insects and other invertebrates, which are also essential for growth in juveniles. Dabbling ducks are easily distinguished by their endearing habit of "tilting up" in shallow water, bill down and tail up, to feed on submerged vegetation and benthic (bottom-dwelling) invertebrates. Dabbling ducks also feed by filtering surface water through the comblike lamellae along the sides of their bills. Their feet are located relatively far forward on their bodies, giving them a moderately good walking ability, and they are able to take off and land abruptly from small areas of water or land. Dabbling ducks are by far the most numerous of Central Valley ducks. Mallard-the most widely distributed duck of the Pacific Flyway-northern pintail, American wigeon, northern shoveler, gadwall, and green-winged and cinnamon teal are important species that winter in the valley. Diving ducks, though nearly as widespread as dabblers, constitute a much smaller proportion-less than 10 percent-of the total duck population of the Pacific Flyway. Diving ducks require more permanent waters than dabblers. As their name suggests, they feed by diving completely below the surface, searching for submergent plant material and invertebrates. They further differ from dabbling ducks in several important respects. Their legs are situated farther back on their body, making them less adept at walking on land. Their generally heavier bodies, relative to wing surface area, require them to run some distance over water prior to reaching minimum flight speed. Their feet and webbing are larger, increasing diving effectiveness, and their bills are generally broad, heavy, and adapted for underwater foraging. Of the diving ducks that winter in the Central Valley, the canvasback, prized by hunters, is numerous, but other pochards, including the lesser scaup, ring-necked duck, and redhead, are also present. Only one species of stiff-tailed duck, the ruddy duck, inhabits the Central Valley. These diving ducks, characterized by upturned, elongated tail feathers, may either reside permanently in the valley or only winter there. They feed mainly on benthic invertebrates for much of the year, but also on submergent foliage and seeds during the winter. Several species of sea ducks, arctic-adapted diving ducks, overwinter in the Central Valley, most notably the common goldeneye and the bufflehead. Unlike dabbling ducks and most other diving ducks, these sea ducks depend predominantly on animal sources of food, including crustaceans, mollusks, and other aquatic invertebrates. The common merganser, possessing a long, thin, serrated bill, adds fish to this diet as well. Common goldeneyes, buffleheads, and common mergansers all breed in riparian woodlands to the north, where they nest in tree cavities. During the winter, they inhabit the Central Valley's rivers and freshwater and estuarine marshes. The wetlands of the Central Valley compose part of a larger system of wetlands that stretches from the Arctic regions of Alaska and western Canada, across the western United States and western Mexico, and beyond to Central America and South America. The migratory routes along this chain of wetlands constitute the Pacific Flyway. Every spring and fall, migratory waterfowl may travel entire continents as they migrate along the flyway between their northern breeding grounds and their southern wintering grounds, including the Great Central Valley of California. It is the migratory waterfowl, above all, that tie together these wetland ecosystems. Thus the destruction-and restoration-of individual wetlands in the Central Valley has ecological repercussions on a range of scales from a particular wetland to, quite literally, the western half of North America. In order to manage the waterfowl of the Pacific Flyway successfully, resource managers have had to come to terms with the ecological processes that unfold on these diverse scales. During the late fall and winter, in any large wetland area in the Central Valley, we are likely to find several species of geese, numerous species of ducks, and perhaps tundra swans as well. For this brief period, these birds form a community, each species present in a particular area because that area meets its biological requirements for resting and feeding, such as shallow water for dabbling ducks and deeper water for diving ducks. Each species occupies a different ecological niche, or functional role, in this community. Resident species are further differentiated by their nesting requirements. Mallards, for example, build their nests on or near the edges of water where the ground is only slightly marshy and where they are concealed by tall emergent plants such as cattails. Northern pintail, on the other hand, almost always nest on dry ground, at times as much as a half-mile from water. The manner in which species of ducks occupy different nesting and feeding spaces, or different niche spaces, may be a result of ecological interactions among species, such as competition for resources, or abiotic considerations, such as water depth and percent of open water to plant cover. These community-level and ecosystem-level considerations, respectively, are essential for successful wetland management. The theory of island biogeography has shown that the spatial area and degree of isolation of islands affect avian species richness by altering the equilibrium between the rate of extinction of species already established and the rate of colonization by new species. Larger and less isolated islands tend to have greater species diversity; smaller and more isolated islands tend to have less. This theory has been successfully applied to nonliteral "island" habitats as well, such as freshwater marshes, which exist as the functional equivalent of islands in a sea of agricultural lands. Consequently, the placement of wetlands in the landscape has implications for both species richness and the regulation of marsh bird populations. A cluster of marshes, or a wetland complex, provides greater habitat heterogeneity for waterfowl than a single, isolated marsh. Heterogeneity, which includes individual marshes at different flooding and drying stages, allows a marsh complex to meet the ecological requirements of a larger number of species than a single large, isolated wetland; at the same time, the presence of more than one marsh reduces the risk of the spread of disease. Seasonally, the heterogeneity offered by a marsh complex is also important in the regulation of breeding duck populations. The number of breeding pairs that a particular wetland can accommodate has been found to be primarily a function of the surface area, rather than the productivity, of the wetland. By contrast, late-summer populations of fledged and adult ducks seek out the most productive ponds, regardless of size. It is clear, then, that wetland managers must take into account landscape-level considerations, and not simply those of individual wetlands. Regardless of how well we may manage an individual wetland, or even a complex of wetlands, these efforts will be to little avail if there are serious problems on successively larger spatial scales. If important wintering habitat, such as that provided by California's Central Valley, disappears-whether the cause is conversion to agricultural land, water development projects, or urban encroachment-migrating waterfowl will suffer high mortality rates from lack of life-sustaining resources and diseases such as avian botulism and cholera, outbreaks of which are intensified by overcrowding on fewer and smaller remaining habitat areas. Alternatively, even if vast expanses of wintering habitat are protected, populations of migratory waterfowl will continue to plummet if the birds' breeding habitat is compromised. Because the overwhelming majority of North American waterfowl breed in Canada and Alaska, ecologists and land-use planners must consider and manage wetlands on vast spatial scales. Waterfowl of the Pacific Flyway constitute the biotic link between distinct river systems and wetland complexes across western North America. Drawing nutrients and water from these systems, waterfowl are themselves literally a product of wetlands. In ecological terms, they are obligate wetland species, dependent on wetlands for the entirety of their life cycle. Within the enormous expanses of wetlands that exist in this region, millions of migratory waterfowl carry out their life cycles, breeding during the spring and summer, often in the Far North, and wintering in southern and more temperate climes. Yet it has perhaps been too easy to take for granted the existence of these millions of Pacific Flyway waterfowl, and the apparent inevitability of their annual return to the Central Valley. Extended periods of drought on the breeding grounds, excessive hunting and the ravages of disease on the wintering grounds, and the widespread destruction of habitat on both breeding and wintering grounds have operated synergistically to produce dramatic reductions in waterfowl populations, which were once so extensive as to darken the sky during their migrations. The precipitous decline of Pacific Flyway waterfowl during the brief century and a half since California statehood highlights the inescapable fact that the system of wetlands and waterfowl that compose the flyway is a historically contingent system, dependent in part on climate but, more important, on the choices made by humanity. Waterfowl are adaptable to changing habitat conditions, but adaptation has its limits. In the wintering grounds of the Central Valley, migratory geese quickly learned to feed on the wheat crops of the late nineteenth century, and migrating ducks learned just as quickly during the early twentieth century that rice fields provided an excellent food source. But wintering waterfowl need more than grains to survive. They require a variety of foods, including aquatic invertebrates, which are found in great numbers in natural wetlands but not in grain fields; they require resting areas where they are protected from predators, including humans; and they require enough wetland habitat to be protected from the spread of disease. Waterfowl are not alone in their dependence on wetlands. Throughout the Central Valley, bald eagles, peregrine falcons, and other birds of prey rely on wetland areas for food. The Butte Basin in the Sacramento Valley is one of the last strongholds of the riparian yellow-billed cuckoo, and the few remaining permanent wetlands of the San Joaquin Valley are crucial to the survival of the giant garter snake. Additionally, many waterbird and upland bird species are associated with the remaining wetland and adjacent upland habitat of the Central Valley. A partial listing of these species includes white pelicans, great and snowy egrets, several grebe species, greater and lesser sandhill cranes, great blue herons, green herons, black-crowned night herons, double-crested cormorants, white-faced ibis, American bitterns, American avocets, black-necked stilts, common snipe, long-billed curlews, and tricolored blackbirds. Conservation policies enacted on local, regional, national, and continental scales have rescued waterfowl from their nadir during the 1930s and have stabilized populations of most waterfowl species, albeit at levels far below those that once prevailed in North America. The uneven success of these efforts points to levels of ecological complexity that we may not yet fully understand and to ecological processes that we may not be fully able to reverse. The overwhelming impetus to protect wetlands in the late twentieth and early twenty-first centuries has come from recognition of the need to protect continental waterfowl populations. In this sense, while waterfowl are clearly dependent on wetlands, wetlands themselves became dependent on waterfowl for their continued existence in the face of pressures from reclamation and development. Waterfowl and other waterbirds can directly affect wetland ecosystems in a number of important ways. They can maintain or increase biological diversity in wetlands by transporting invertebrates and invertebrate eggs, as well as plant seeds, in or on their plumage. In addition, ducks transport seeds in their digestive tracts, a small percentage of which remain viable after passage. Herbivorous birds such as snow geese and white-fronted geese can significantly reduce emergent vegetation and, by digging out tubers, can deepen basins, thereby retarding plant succession and the filling in of marshes. Carnivorous birds such as mergansers, cormorants, pelicans, and herons can remove a substantial amount of biomass in the form of aquatic invertebrates, fish, and amphibians, as well as small mammals and other birds. Less direct, but more widespread, is the influence of waterbirds on wetlands owing to nutrients excreted into the water column and substrate. Flocks of waterfowl attracted to wetland sites deposit nutrients in amounts significant enough to increase the growth of algae, thus influencing food webs and larger ecosystem processes. In each of these ways, waterfowl and other waterbirds influence wetland development and community structure. The fundamental relationship between waterfowl and wetlands, manifested in the transfer of resources between them, necessitates that this system be studied on a wide range of scales, from individual wetlands nestled in the Central Valley to the Pacific Flyway as a whole. Though totaling only a fraction of their historic magnitude, waterfowl numbers along the Pacific Flyway remain daunting. Midwinter inventories compiled annually by the U.S. Fish and Wildlife Service since 1955 record an average of more than 6.6 million waterfowl wintering in the U.S. portion of the flyway. Midwinter inventory data from a representative five-year period, 1973-1977, record that 60 percent of the total Pacific Flyway population, including nearly 4.7 million ducks and 570,000 geese, were found in the Central Valley. These numbers are conservative because the midwinter counts do not necessarily reflect peak populations of ducks and geese, nor do they reflect the total waterfowl population that utilizes the Central Valley during the winter. Birds en route to and from wintering grounds farther south in California's Imperial Valley, western Mexico, and beyond utilize Central Valley waterfowl habitat as migration staging areas. A more comprehensive range that reflects this transitional use is ten million to twelve million ducks and geese, accompanied by hundreds of thousands of shorebirds and other waterbirds, that either winter in or migrate through the Central Valley of California. The overwhelming majority of Pacific Flyway waterfowl breed in the vast wetlands of western Canada and Alaska, which together contain approximately 550,000 square miles of wetlands, 25 percent of the estimated world's total. Of that amount, approximately 266,000 square miles, or a little less than half, are concentrated in Alaska. The relatively limited development that has taken place in Alaska has cost that state, unlike the rest of the United States, only a fraction of 1 percent of its wetland heritage. The most important waterfowl production areas in western Canada and Alaska are watersheds and deltas, and forests and tundra. Farther to the south and east, the prairie pothole region of south-central Canada and the north-central United States is the major duck production area for North America. Although the pothole region supplies only a small portion of its duck production to the Pacific Flyway, it is important to the flyway nonetheless. The western region of the contiguous United States, including California's Great Central Valley, contributes to Pacific Flyway populations as well, though on a smaller scale. The Yukon-Kuskokwim Delta bears the names of Alaska's first and second largest rivers, which create its expanse of 26,000 square miles, preserved in the Yukon Delta National Wildlife Refuge. Flowing westward toward the Bering Sea, the Yukon and Kuskokwim rivers approach within twenty-five miles of each other and then diverge sharply for the last hundred miles of their journey, the Yukon veering to the northwest and the Kuskokwim to the southwest. The delta that lies between them-a vast, sprawling, treeless wetland plain-is North America's most productive waterfowl nursery. The delta's rivers, streams, sloughs, lakes, and ponds support roughly 750,000 geese and swans, two million ducks, and more than five million shorebirds. Included among these are major proportions of the North American populations of tundra swans and greater white-fronted and cackling geese. Many northern wetlands, the Yukon-Kuskokwim Delta included, serve as both breeding areas and staging areas for migration. Cackling geese migrate southward from their staging areas in the delta across the Alaska Peninsula and the Gulf of Alaska, and then follow the coast of British Columbia across the Canadian border as far as the mouth of the Columbia River, which forms the border between the states of Washington and Oregon. Proceeding inland along the Columbia, they then turn southward again to their wintering grounds in the Sacramento Valley and northern San Joaquin Valley. The Central Valley is the destination for many white-fronted geese as well. These geese have been recorded flying nonstop from their staging areas in the Yukon-Kuskokwim Delta to Summer Lake in Oregon or Tule and Klamath lakes on the California-Oregon border, a distance of 2,300 miles. Flying at an average speed of forty-five miles per hour, this continuous flight lasts for more than fifty hours, making it one of the longest nonstop flights of any goose species. After resting and refueling for a week or two, the geese then make one last overnight flight to their wintering grounds in the Sacramento Valley. In contrast to the open, treeless tundra of the coast, the Yukon Flats area of interior northeastern Alaska is clothed in willow, aspen, and spruce. There are an estimated forty thousand lakes and potholes in this broad, crescent-shaped valley, which lies within the Yukon Flats National Wildlife Refuge. The lakes are extremely productive, perhaps because of deep-burning fires in the area that release minerals and other nutrients otherwise bound up in undecayed peat bogs. One million to two million ducks nest annually at Yukon Flats. The predominant species include canvasback, mallard, northern pintail, lesser scaup, American wigeon, and northern shoveler; roughly ten thousand to fifteen thousand geese of various species are present as well. Yukon Flats and the Yukon-Kuskokwim Delta combined are responsible for about half of Alaska's annual waterfowl crop. Both regions are also important breeding areas for the lesser sandhill crane. The cranes are popular winter visitors in California's Central Valley, where these stately three-foot-tall birds may be found in refuges and flooded rice fields. Across the Canadian border from Yukon Flats, in the western Yukon Territory, lies Old Crow Flats, a basin of nearly two thousand square miles. The basin is a fossil delta of the Old Crow River, a tributary of the Porcupine River, itself a tributary of the Yukon. The basin is laced with shallow lakes and ponds that are bordered by both open and forest tundra. Historically, it has supported, on average, nearly half as many breeding ducks as Yukon Flats, and is a particularly important area for diving ducks. In addition to its role as an important breeding ground, Old Crow Flats serves as a major staging area for migrating ducks, geese, and swans. The Peace-Athabasca Delta in northeastern Alberta, occupying twelve hundred square miles, is the largest freshwater inland boreal delta in the world, and is the southernmost of the Canadian deltas of major importance for breeding Pacific Flyway waterfowl. Comprising the Athabasca River Delta, the Peace River Delta, and the much smaller Birch River Delta, this wetland paradise is one of the most important waterfowl nesting and staging areas in North America. The major lakes of the delta are shallow and foster a thick growth of submergent and emergent vegetation during the growing season. The shallow water, high fertility, and relatively long growing season for such northern latitudes make the delta an abundant food source, one of particular importance during drought years in the breeding grounds of the prairie pothole region to the south. In the spring and fall, more than one million birds use the Peace-Athabaska Delta, including the world's entire nesting population of the endangered whooping crane. The delta is a vital link in the migration of the lesser snow goose, greater white-fronted goose, Canada goose, tundra swan, and at least fourteen duck species. The Peace-Athabaska Delta occupies the southeastern corner of the tremendous Wood Buffalo National Park, the largest national park in Canada. In the park, the most expansive undisturbed grass and sedge meadows in North America support an estimated population of ten thousand wood and plains buffalo. The enormous Mackenzie River system connects the Peace-Athabasca Delta to the Arctic Ocean. More than 2,600 miles long including its headstreams, the Mackenzie River is the longest river in North America, draining a basin of nearly 700,000 square miles. North of the Peace-Athabasca Delta, the Peace and Athabasca rivers merge as the Slave River, which flows northward to Great Slave Lake in the Northwest Territories, where it forms an important delta for waterfowl in its own right. The outflow from Great Slave Lake is the Mackenzie River proper, which, unfrozen for only five months of the year, flows northward for almost eleven hundred miles through boreal forests and then forest tundra before finally emptying into the Beaufort Sea in the Arctic. As the river approaches the Beaufort Sea, its main stem divides into multiple channels, which fan out across its hundred-mile-long delta. Along the Mackenzie Delta, spruce trees give way to willows, then to sedge meadows, and finally to bare mudflats. Nearly five thousand square miles in area, the delta is rich in duck food-submerged aquatic vegetation, and aquatic insects and other invertebrates. Aerial surveys suggest that the delta has supported populations of well over a quarter of a million ducks. Of the many species that breed in the Mackenzie Delta, the northern pintail, American wigeon, mallard, common goldeneye, green-winged teal, northern shoveler, and canvasback migrate to the Central Valley. The delta serves as a major staging area as well. Snow geese that nest on Banks Island, four hundred miles to the northeast, and on the Arctic coast gather at the delta before beginning their journey to the Central Valley of California and beyond, as far as the highlands of central Mexico. The waterfowl of the Pacific Flyway that breed in these watersheds and deltas of the interior of Alaska and Canada migrate southward through Canada's prairie provinces of Alberta, Saskatchewan, and Manitoba, at which latitude the flyways are not yet distinct. The routes branch near the international border. Some birds turn southeastward into the Central and Mississippi flyways. Those that use the Pacific Flyway turn southwestward across northwestern Montana and the Idaho panhandle, follow along the Snake River and Columbia River valleys, and then turn southward again across central Oregon to their final destination in the Central Valley of California. The northern woodlands of Canada and Alaska are part of a vast expanse of approximately 3.5 million square miles of North American boreal forest that stretches from Alaska to Canada's Atlantic Coast. This forest, also known as taiga, lies between tundra to the north and deciduous forests and grasslands to the south and is characterized by spruce, fir, and other coniferous trees, as well as aspen and birch. Much of the ground surface of the boreal forest is covered with lichen and, during the summer months, is often marshy. Waterfowl densities in these woodlands are lower than those of the northern watersheds and deltas, averaging between one and five breeding birds, mostly ducks, per square mile, but the region's vast expanse, filled with lakes and streams, still results in a substantial contribution to the continent's total waterfowl population. North of the woodlands, the treeless tundra is especially important for goose production. Permafrost lying only inches below the ground surface precludes drainage, and the short summer thaw of the uppermost topsoil therefore produces wet and marshy conditions and fine breeding habitat. Along the coastline and on the coastal plain of Canada and Alaska, as well as on the Canadian Arctic Archipelago, all species of geese nest in tundra, and it is there that most North American geese are produced. The tundra of the western and central Canadian Arctic is especially important for the white goose species of the Pacific Flyway, which nest in this region in enormous colonies. The tundra of the lower basin and delta of the Egg River on Banks Island, the westernmost island in the Arctic Archipelago, is probably the greatest single snow goose production area in North America. More than two hundred thousand nesting pairs of these white geese have been found on the island. They arrive at their nesting grounds in May and must carry out their entire breeding cycle in the short span of the high Arctic summer. Eggs incubate for twenty-eight days. Goslings fledge in fifty-six days. Then the snow geese are on the move again. Their migration route is from Banks Island to Freezeout Lake in Montana via the lakes of southern Saskatchewan and Alberta. From Montana they veer westward to Oregon's Summer Lake and Tule and Klamath lakes on the California-Oregon border. When the lakes freeze in mid-November to early December, they fly to their final winter destination, the Central Valley of California. The main breeding area of the Ross's goose, the other North American white goose, lies farther east in the central Canadian Arctic, on the tundra near Queen Maud Gulf. Half a million Ross's geese have been recorded nesting in this region, where a single colony has numbered as many as 291,000 birds. Approximately one-third of these Ross's geese migrate along the Pacific Flyway to their wintering grounds in the Central Valley, with the remainder going to the Central and Mississippi flyways. The prairie pothole region stretches across the semiarid, treeless prairies of the southern third of the provinces of Alberta, Saskatchewan, and Manitoba, and continues south of the United States border into northeastern Montana, North Dakota, South Dakota, western Minnesota, and Iowa, demonstrating the stubborn resistance of ecosystems to respecting national boundaries. The landscape here is dotted with more than four million small wetlands, known simply as potholes. They were formed approximately eleven thousand years ago as the glaciers of the Wisconsin Ice Age, the last glacial period of the Pleistocene, receded and molded the landscape into a "poorly drained terrain pock-marked with millions of relatively small depressions, the potholes." Of a total of 300,000 square miles, approximately 65 percent, or 194,000 square miles, of the prairie pothole region lies in Canada; the remaining 35 percent, or 106,000 square miles, lies in the United States. Known as North America's "duck factory," the prairie pothole region is the most important area for duck production on the entire continent. Its numerous shallow lakes and marshes, rich soils, and warm summers also render it one of the most important wetland regions in the world. Historically, from 50 percent to as much as 75 percent of all the ducks originating in North America have come from the pothole region, yet it accounts for only 10 percent of the total waterfowl breeding area on the continent. The prairie pothole region contributes fewer ducks to the Pacific Flyway than to the Central and Mississippi flyways to the east, but its contribution to the Pacific Flyway is nevertheless substantial. Alberta, the westernmost province of the region, is a particularly important breeding area for Pacific Flyway ducks, and, overall, the ponds and lakes of the western prairies provide resting habitat for many Pacific Flyway waterfowl on their migrations to and from the northern interior. In the short term, the greatest regulator of prairie duck numbers is drought. But in the longer term the greatest threat to the production of waterfowl in this region of North America is the destruction of the potholes themselves. Much like the freshwater marshes of the Central Valley, the potholes have been under intense pressure from agricultural development. By the early years of the twentieth century, railroads had cut across the breeding grounds of the prairie pothole region in both the United States and Canada, opening up the region to settlement and agriculture. The direct loss of the wetland basins through artificial drainage and the accompanying deterioration of marsh-edge vegetation-the essential upland component of waterfowl habitat-has been a major factor in the diminishing annual production of waterfowl. In the 1850s, wetlands covered between 16 percent and 18 percent of the prairie regions of Minnesota, the Dakotas, and Iowa. By the 1990s, at least half of this wetland area had been lost; only 8 percent of these prairie regions remained as wetlands. Canadian losses are even greater. By the late twentieth century, as much as 71 percent of the original wetland area of the prairie provinces may have been lost. Widespread recognition of the importance of this dwindling "duck factory" has led to impressive conservation efforts on both sides of the border. The Canadian Wildlife Service, the U.S. Fish and Wildlife Service, and private organizations such as Ducks Unlimited and the Nature Conservancy have been working together since the late 1980s to protect the remaining prairie potholes. A small percentage of the waterfowl of the Pacific Flyway breeds in the western United States, a region that is generally more important for its wintering grounds than for its breeding grounds. Despite widespread wetland reclamation, some important waterfowl production areas remain, many of which are managed by the federal or state governments. In the Klamath Basin, Lower Klamath and Tule lakes on the California-Oregon border were once expansive marshes and overflow lands of the Klamath River and Lost River drainages. Although the federal government reclaimed much of this area for agriculture during the early years of the twentieth century, high-quality duck production habitat still exists in the Klamath Basin on Lower Klamath, Tule Lake, and other national wildlife refuges, which also serve as important migratory stopovers for approximately three-quarters of the waterfowl of the Pacific Flyway. Other important western production areas include the Malheur National Wildlife Refuge and Summer Lake in southeastern Oregon, Stillwater National Wildlife Refuge in western Nevada, and the Great Salt Lake marshes of the Bear River National Wildlife Refuge in northern Utah. The Bear River marshes, the easternmost of these areas, provide waterfowl not only to the Pacific Flyway, but also to the Central and Atlantic flyways. Those ducks that join the Pacific Flyway routes enter California via two parallel routes, either through the northeastern part of the state or over the Sierra Nevada near Lake Tahoe. They converge in the Central Valley near the Sacramento-San Joaquin Delta. The Central Valley itself was once an important production, as well as wintering, area for ducks. Similar to other inland freshwater wetlands, the valley's basin wetlands lack current and have little wave energy except that produced by wind, and therefore have little impact on nests, young, or food resources, making them especially appealing to breeding waterfowl. Historically, important nesters included northern pintail, mallards, gadwalls, cinnamon teal, northern shovelers, redheads, and ruddy ducks. This production function diminished in the Central Valley as wetland acreage plummeted; but by the early twenty-first century wetland restoration efforts had begun to reverse this prolonged decline. Breeding waterfowl populations, though never more than a fraction of the number of the valley's wintering waterfowl, began to rise. Efforts to protect the breeding grounds of waterfowl-ranging from the creation of national wildlife refuges in Alaska to the establishment of conservation programs in the prairie potholes-have numerous parallels to efforts to protect the more southerly wintering grounds of waterfowl in the Central Valley of California. Most of the remainder of this book will narrow the focus from western North America back to the Central Valley, investigating the human and nonhuman history of the valley's wetlands over the past two centuries. When the wetlands of California's Great Central Valley were first drained, the protection of the migratory waterfowl that inhabited them was simply not a consideration. During the course of the twentieth century, however, the ducks and geese of the Pacific Flyway became the paramount reason for the protection and restoration of these wetlands. Before Californians could reverse the course of their actions, it was first necessary for them to perceive that land use changes at the local level have unambiguous repercussions for waterfowl on regional and continental scales. And in order for those repercussions to matter, Californians needed to rethink the place of humans in nature, to shift-at least a little-from an anthropocentric to a biocentric view of the world. We cannot expect to learn directly from or communicate with waterfowl; they speak separate languages, hear different voices, know other sensory worlds. They transcend our own perceptions, make mockery of our national boundaries, ignore our flyway concepts. They have their own innate maps, calendars, and compasses, each older and more remarkable than our own. We can only delight in their flying skills, marvel at their regular and precise movements across the continent, take example in their persistence in the face of repeated disaster. They are a microcosm of nature, of violent death and abundant rebirth, of untrammeled beauty and instinctive grace. We should be content to ask no more of them than that they simply exist, and we can hope for no more than that our children might know them and enjoy them as we do. 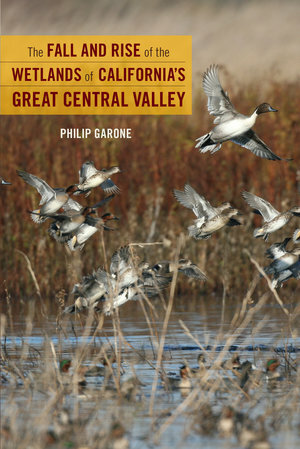 This is the first comprehensive environmental history of California’s Great Central Valley, where extensive freshwater and tidal wetlands once provided critical habitat for tens of millions of migratory waterfowl. Weaving together ecology, grassroots politics, and public policy, Philip Garone tells how California’s wetlands were nearly obliterated by vast irrigation and reclamation projects, but have been brought back from the brink of total destruction by the organized efforts of duck hunters, whistle-blowing scientists, and a broad coalition of conservationists. Garone examines the many demands that have been made on the Valley’s natural resources, especially by large-scale agriculture, and traces the unforeseen ecological consequences of our unrestrained manipulation of nature. He also investigates changing public and scientific attitudes that are now ushering in an era of unprecedented protection for wildlife and wetlands in California and the nation. Philip Garone is Associate Professor of History at California State University, Stanislaus.